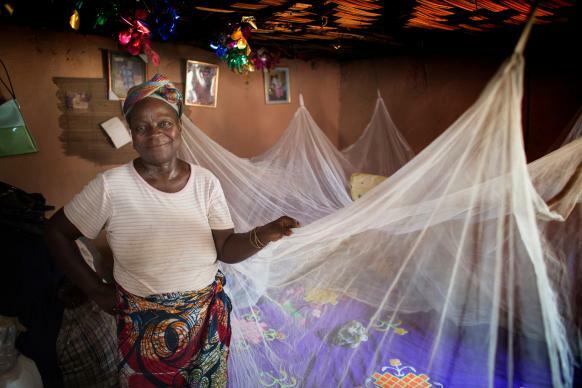 Matilda Ndanema displays the insecticide-treated mosquito net she received from the United Methodist Church's Imagine No Malaria campaign in 2010 at her home in Bumpe, near Bo, Sierra Leone. As the Imagine No Malaria campaign enters its home stretch, United Methodists can look with satisfaction at $60 million already raised, and with hope and confidence toward surpassing the $75 million goal by the end of 2015. Most of the money raised has been from grassroots efforts like bake sales, car washes and children donating birthday money. "Now, gifts of $1 million are coming in, and there are opportunities for more of these," said Bishop Thomas Bickerton, chairperson of the executive committee for Imagine No Malaria. Malaria has been killing for thousands of generations, but improved prevention, sanitation and healthcare have all but eliminated it from the developed world. Despite this progress, however, malaria continues to kill at a rate of almost one death every minute in Africa—millions of children infected each year. These needless deaths have galvanized United Methodists, particularly those who have been to Africa and have witnessed the extent of malaria’s devastation. Donnellson United Methodist Church in Iowa has fewer than 50 people in worship on Sundays, yet, on average, church members have donated $187 per person. Donnellson UMC’s pastor, the Rev. Peggy Ellingson, said her church’s active mission focus has led members to visit Africa several times. It was first-hand experience that moved Mary Joy and Jerre Stead to give $1 million to Imagine No Malaria in April, 2014. The couple visited Africa four years ago and the experience stuck with them. The Steads have a family foundation and meet twice a year with their children and grandchildren to choose a cause to support. Bishops in separate jurisdictions do not usually collaborate on fundraising, however, when Imagine No Malaria staff realized that Bishops Stanovsky and Trimble were both approaching the Steads, everyone realized they should work together. With connections to Colorado and Iowa, the Steads decided to give $500,000 each to the Rocky Mountain Conference and the Iowa Conference with hopes that this “leadership gift” will encourage others to follow suit. "What’s so good about this is that the maximum amount of dollars goes to the maximum amount of people,” Jerre Stead said. And the "leadership gifts" have not stopped local churches from raising money in ways that go beyond bake sales and special collections. St. Luke’s UMC in Highlands Ranch, Colorado, for instance, will hold a benefit concert at the Kennedy Center in Washington, D.C. in 2015, with all proceeds going to Imagine No Malaria. Trinity United Methodist Church in Denver is raising $2.5 million for a capital campaign, and will give $125,000 above the $100,000 they have already collected. “I’ve never seen people have so much fun raising money and saving lives!” said Bishop Stanovsky. “Imagine No Malaria is saving lives, building leaders and impacting education about global health challenges,” said Bishop Trimble. “Encouragement comes in many forms and giving is one of them. The impact of giving has positive ripple effects—from the children of Iowa, the high school students who ran across the state and the silent donors who give day in and day out making miracles happen." The United Methodist Church has operated hospitals and clinics in Africa for more than 200 years. Imagine No Malaria takes decades of good work a step further. The campaign allows the church to offer a comprehensive plan that relies on full partnerships with African communities, focusing equally on four efforts: prevention, treatment, education and communications. “Where better can you make a difference than channeling through The United Methodist Church to attack a global issue?” asked Jerre Stead. “There’s not a lot of places that allow investments like leadership gifts to maximize the return, and (the church is) clearly one. It’s an excellent one." Ellingson sees the success of Imagine No Malaria as something that can be replicated. She said that if everyone works together, other world problems can be solved. *Edwin Acevedo is a contributing writer for the Public Information Team at United Methodist Communications. Contact: Diane Degnan, Nashville, Tenn., (615) 742-5406, or presscenter@umcom.org.